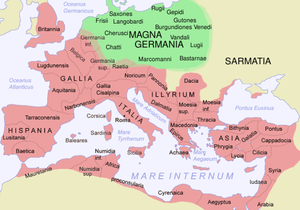 Germania (/dʒərˈmeɪniə/; Latin: [ɡɛrˈmaː.ni.a]) was the Roman term for the geographical region in north-central Europe inhabited mainly by Germanic peoples. 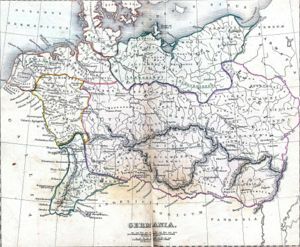 Germania extended from the Rhine eastward to the Vistula river, and from the Danube and Main river northward to the Baltic Sea. The areas west of the Rhine were mainly Celtic (specifically Gaulish) and became part of the Roman Empire in the first century BC. Some Germani, perhaps the original people to have been referred to by this name, had lived on the west side of the Rhine. At least as early as the 2nd century BC this area was considered[by whom?] to be in "Gaul", and became part of the Roman empire in the course of the Gallic Wars (58–50 BC). These so-called Germani cisrhenani lived in the region of present-day eastern Belgium, the southeastern Netherlands, and stretching into Germany towards the Rhine. During the period of the Roman empire, more tribes settled in areas of the empire near the Rhine, in territories controlled by the Roman Empire. Eventually these areas came to be known as Lesser Germania, while Greater Germania (Magna Germania; it is also referred to by names referring to its being outside Roman control: Germania libera, "free Germania") formed the larger territory east of the Rhine. The Romans under Augustus began to conquer and defeat the peoples of Germania Magna in 12 BC, having the Legati (generals) Germanicus, and Tiberius leading the Legions. By 6 AD, all of Germania up to the River Elbe was temporarily pacified by the Romans as well as being occupied by them, with Publius Quinctilius Varus being appointed as Germania's governor. The Roman plan to complete the conquest and incorporate all of Magna Germania into the Roman Empire was frustrated when three Roman legions under Varus command were annihilated by the German tribesmen in the Battle of the Teutoburg Forest in 9 AD. Augustus then ordered Roman withdrawal from Magna Germania (completed by AD 16) and established the boundary of the Roman Empire as being the Rhine and the Danube. Under Emperors Vespasian and Domitian, the Roman Empire occupied the region known as the Agri Decumates between the Main, Danube and Rhine rivers. The region soon became a vital part of the Limes Germanicus with dozens of Roman forts. The Agri Decumates were finally abandoned to the Germanic Alemanni, after the Emperor Probus' death (282). ^ Gustav Solling, Diutiska, an historical and critical survey of the literature of Germany, from the earliest period to the death of Göthe (1863), p. 3. ^ Schulze, Hagen (1998). Germany: A New History. Harvard University Press. p. 4. ISBN 0-674-80688-3. ."German", The Concise Oxford Dictionary of English Etymology. Ed. T. F. Hoad. Oxford: Oxford University Press, 1996. Oxford Reference Online. Oxford University Press. Retrieved March 4, 2008. ^ Tacitus, Germania 2. Ceterum Germaniae vocabulum recens et nuper additum, quoniam qui primi Rhenum transgressi Gallos expulerint ac nunc Tungri, tunc Germani vocati sint: ita nationis nomen, non gentis evaluisse paulatim, ut omnes primum a victore ob metum, mox etiam a se ipsis, invento nomine Germani vocarentur. ^ Laurent Edward, Peter. "A Manual of Ancient Geography". 13 November 2014. H Slatter, 1840, p 163-168, The British Library. Retrieved 11 February 2015. ^ Stümpel, Gustav (1932). Name und Nationalität der Germanen. Eine neue Untersuchung zu Poseidonios, Caesar und Tacitus (in German). Leipzig: Dieterich. p. 60. OCLC 10223081. ^ Feist, Sigmund (1927). Germanen und Kelten in der antiken Überlieferung (in German). Baden-Baden. ^ Kleineberg, Andreas (2010). Kleineberg, Andreas; Marx, Christian; Knobloch, Eberhard; Lelgemann, Dieter, eds. Germania und die Insel Thule. Die Entschlüsselung von Ptolemaios' "Atlas der Oikumene" [Germania and Thule Island. The Decipherment of Ptolemy's Atlas of the Oikoumene] (in German). Darmstadt: Wissenschaftliche Buchgesellschaft. ISBN 978-3-534-23757-9. OCLC 699749283. ^ Jones, Terry and Alan Ereira (2006), "Terry Jones' Barbarians", p.97. BBC Books, Ltd., London, ISBN 978-0-563-53916-2. ^ Frederic Austin Ogg. "A Source Book of Medieval History." American Book Company, New York; pp. 19-21.